A bear effigy mound, outlined in limestone as part of an aerial photography experiment. NPS photo. The eastern half of the United States has a wide variety of ancient and historic earthen mounds, ranging from simple conical mounds to large platform mounds and complex concentric circles. These earthen architecture structures were built by many different American Indian groups over several thousand years. In the Midwest, effigy mounds built in the shapes of bears, birds, panthers, snakes and water spirits were particularly prevalent. These mounds are primarily found in southern Wisconsin, northern Illinois, eastern Iowa, and southeastern Minnesota. They date to about AD 650-1200, and were probably built by the ancestors of the Ho-Chunk and other Midwestern tribes (Goldstein 2009). The mounds are commonly located on flat high areas overlooking rivers and streams, especially where they intersect wetlands and lakes. These areas afforded good views, and the mounds would probably have been visible from long distances, especially if nearby trees were removed. Excavations of mounds have uncovered human remains; besides burial sites, the mounds probably also functioned as territory markers and as multi-purpose ceremonial places. The lakes and marshes associated with the effigy mounds were productive sources of food, especially in winter. The people who built and used the mounds lived in small nearby villages. They hunted, fished, and gathered wild plant products, but also had small gardens where domesticated plants such as sunflower and squashes were grown. Thanks to the foresight of energetic citizens, local politicians and community leaders, some of these effigy mounds are preserved in parks. One group of mounds is protected in a national monument. Congress and the President create national monuments through the agency of the Antiquities Act, which allows the Federal government to set aside public lands. Effigy Mounds National Monument (NM), located on the Mississippi River in northeastern Iowa, protects over 200 mounds of Native American origin, 31 of which are bird and bear effigy mounds. 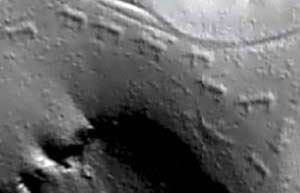 The mounds still have much to tell us and new technologies are revealing their secrets. The elevated perspective that aerial photography and LIDAR (Light Detection and Ranging) provide allows more detailed and complete comprehension of the full extent of mounds on the landscape than does terrestrial reconnaissance. The story of the documentation and study of Native American earthen mounds is a fascinating chapter of American archeology. The very first publication of the Smithsonian Institution was devoted to questions of the origin, antiquity, and identify of the moundbuilders. Ephraim Squier, a journalist, and Edwin Davis, a physician, met in Chillicothe, Ohio in 1845. They were both intrigued by the variety of ancient mounds in the area, and began spending time together. Eventually, through the support of the Smithsonian Institution, the two launched a large scale investigation of mound sites primarily in Ohio and nearby Kentucky. The resulting book, published in 1848, “is one long argument that the moundbuilders were a race [with] deep historical connections to the semi-civilized peoples of Mexico and Peru” (Meltzer in Squier and Davis 1998). These conclusions met mixed reviews in scientific circles, and the identity of the architects of ancient earthen mounds was not satisfactorily resolved. More than thirty years after the publication of Ancient Monuments of the Mississippi Valley, the Division of Mound Exploration, Bureau of Ethnography, Smithsonian Institution, was established in 1881. The director of the division, Cyrus Thomas, had four objectives: to identify the full range of mound variation and to develop a taxonomy; to identify and investigate the mode of mound construction; to examine the geographical distribution of mound types; and to collect and analyze representative artifact assemblages (Smith 1985:9). Over the 8 years of field work between 1882 and 1890, employees of the Division visited over 2,000 mounds (Thomas 1985:108). This work culminated in Report on the Mound Explorations of the Bureau of Ethnology, adding to the growing volume of information about mound sites, which were fast disappearing. The study conclusively demonstrated that the moundbuilders were the ancestors of the living Native Americans. Between 1915 and 1929, Congressional representatives from Iowa introduced into the United States Congress, on no fewer than six occasions, legislation to create an Upper Mississippi River National Park. A park feasibility study was finally authorized and approved on June 16, 1930. In 1931, the National Park Service sent Yellowstone National Park Superintendent Roger W. Toll to conduct the survey mandated by the feasibility study. The Toll Report, which was completed on October 8, 1931, did not support the establishment of a national park on the Upper Mississippi River. Despite this setback, Toll’s report did sow the seeds for the creation of a national monument. ...Along the banks of the Mississippi River there are prehistoric mounds built by Indians and used as burial places… It seems desirable that some representative examples be preserved, since they are of great archaeological interest to the present and future generations. (Toll to NPS Director Albright 1931). Almost immediately, the national park movement in Iowa became the national monument movement. On October 25, 1949, President Harry S. Truman signed the proclamation that created Effigy Mounds NM, which at that time consisted of the Jennings-Liebhardt tract (South Unit) and the Yellow River Unit (North Unit). Following the presidential proclamation, the NPS assumed management of an additional 204 acres transferred by the state of Iowa to the Federal government in 1951-1952. The Des Moines Founders Garden Club donated 40 acres, containing Founder’s Pond, in 1955. The 100-acre Ferguson tract was added in 1961. Addition of the Sny Magill property doubled the number of mounds within the monument in 1962. In 1999, the Iowa Natural Heritage Foundation purchased the 1,000 acre Kistler-Ferguson Tract and transferred it to the NPS, increasing the total size of the Monument to 2,526 acres. The monument now contains 191 known prehistoric Indian mounds, including 31 bird and bear effigies, making Effigy Mounds NM the largest known concentration of mounds remaining in the United States. During the 1980s, another shift of emphasis took place, this time the transition being from a more traditional “scientific” perspective to one that viewed the mounds and associated landscape from a more humanistic perspective. While the “science” of the mounds still mattered, the fact that the monument was interpreting what modern American Indians considered to be a “sacred landscape” began to be recognized. The passage in 1990 of The Native American Graves Protection and Repatriation Act (NAGPRA) promoted this shift, and subsequently opened a new chapter in the history of the monument. This act requires Federal agencies and museums that possess Native American human remains and cultural items to consult with lineal descendants and culturally affiliated Indian tribes. Consultation and dialog that began in the 1990s led to the development of long-absent connections between the monument, its affiliated tribes, and the living descendants of the Native American mound builders. Early archeological surveys documented the existence of effigy and other types of mounds in the vicinity of the national monument that were later obliterated by agricultural practices. During the 1880s and 1890s, Theodore Hayes (T.H.) Lewis conducted some of the earliest mound surveys done in the upper Mississippi Valley. Lewis worked for Alfred Hill on the Northwestern Archaeological Survey, the most extensive, privately supported archeological project ever initiated in North America. The Lewis - Hill partnership was impressive: Lewis would conduct fieldwork and send his detailed notes back to Hill in St. Paul, Minnesota. There, Hill oversaw draftsmen and surveyors who translated the notes into measured drawings. These efforts led to the production of many superb maps of more than 2,000 mound and village sites containing more than 17,000 individual mounds and earthworks. Because many of the mounds that existed when Lewis was doing his survey work in the late 19th century have since been obscured or destroyed, these early sketches, summaries and maps are an invaluable resource in learning about mound groups and locations that are no longer plainly visible. Map drawn by Ellison Orr in 1910 of the Marching Bear Group. Reproduced from the Ellison Orr Collection. NPS photo. Ellison Orr also mapped mounds in Iowa. An accomplished surveyor, Orr began to map mound groups and other archeological features in northeastern Iowa in the late 19th and early 20th century. Working with his son Harry in 1910, he created the “Pleasant Ridge Mound Group” map (i.e. 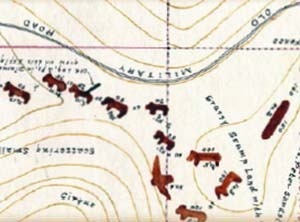 the Marching Bear Mound Group in Effigy Mounds NM) (Figure 1). Shortly after retiring at the age of 73 from the local telephone company in 1930, Orr was hired as chief field supervisor for the State Archaeological Survey. Dr. Charles Keyes, director of the office, secured funding through the Federal Emergency Relief Administration and the Works Projects Administration (WPA) to conduct a series of archeological excavation and survey projects around the state. Had it not been for Orr’s mapping skills and interest in the past, much information about Iowa archeology would be lost forever. A lifetime of dedicated recordkeeping led to the creation of 15 volumes of reports, maps, drawings, photographs, diaries, correspondence, and other miscellaneous papers. Through time, these works have proven to be an absolute treasure to historians, archeologists, ecologists, and everyday people who have an interest in the past. During the 1970s and the early 1980s, Professor R. Clark Mallam and colleagues at Luther College Archaeological Center focused a significant amount of attention on recording and assessing the condition of mounds associated with the Effigy Mound Tradition in northeastern Iowa. Because of the mounds’ low relief, frequently no greater than one to one-and-a-half feet in height, they were exceedingly difficult to photograph. This led to an experimental project in the early 1970s, where the Capoli Bluff Mound Group near Lansing, Iowa, was outlined in agricultural lime and photographed aerially. In 1977, a partnership was established with Effigy Mounds NM whereby the mound groups within the monument was outlined and photographed. The result of this partnership was the creation of the most well-known and visually impressive photographs of any archeological sites from within the state of Iowa. 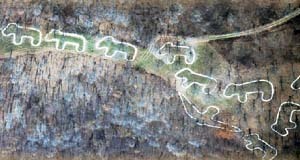 Aerial photograph of the Marching Bear Group, outlined in agricultural lime,1978. NPS Photo. Photographs were also taken of other mound groups within the monument. Photos of the Sny Magill Mound Group indicated the existence of 97 mounds, more than had been recorded in earlier surveys. In 1980, Professor Mallam and James Mount, Chief Ranger / Park Archeologist at Effigy Mounds NM, published an article on their photographic research. In the article, Mallam and Mount argued that by looking at them from an aerial perspective, the mounds could be viewed as artistic creations which symbolically integrate prehistoric beliefs and values. Archeologists have long dreamed of having a “magic window” that would allow them to look into the ground to see what’s there without having to destroy the site. Modern geophysics is moving archeology closer to this dream. Geophysics is the study of the earth by observation through its physical properties. Geophysical tools and techniques used by archeologists today include magnetometers, ground-penetrating radar, and LIDAR. Ground-penetrating radar (GPR) is a tool that uses radar pulses to “see” what is beneath the surface of the ground. This technique has been used to non-destructively identify burial mounds or other archeological sites that are not clearly evident to the human eye. LIDAR is an optical remote sensing technology that measures properties of scattered light to find range and / or other information of a distant target. In archeology, it can be used to identify and create images of archeological sites. LIDAR (Light Detection and Ranging) image of the Marching Bear Mound Group, 2007. Iowa Department of Natural Resources Image. 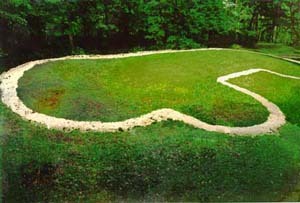 Modern technology, such as LIDAR, ground penetrating radar, and proton magnetometers are currently assisting researchers in uncovering a whole series of tantalizing clues that may eventually lead to the identification of “lost” effigy mounds that were thought to have been completely destroyed. Small anomalies in soil properties and elevations, along with advances in archeologists’ abilities to detect these anomalies, may some day enable the reconstruction of a more complete and representative effigy mound landscape. This research, however, would not be possible if not for the foresight of citizens, local politicians and community leaders to proactively protect and preserve the surrounding land as Effigy Mound NM, ensuring that the mounds would be available to ponder their meaning, to research and to enjoy for many years to come. 2009 Effigy Mounds National Monument and Other Sites. In Archaeology in America, Vol. 2, edited by Francis P. McManamon, pages 121-126. Greenwood Press, Westport Connecticut. HRA Gray & Pape, LLC. 2003 Figures on the Landscape. Effigy Mounds National Monument Historic Resource Study. National Park Service, Department of the Interior, Washington DC. 1998 Introduction: Ephraim Squier, Edwin Davis, and the Making of an American Archaeological Classic. In Ancient Monuments of the Mississippi Valley, by Ephraim G. Squier and Edwin H. Davis, Smithsonian Classics of Anthropology, Smithsonian Institution Press, Washington DC. 1989 The Perpetual March: An Administrative History of Effigy Mounds National Monument. National Park Service Midwest Regional Office Omaha, Nebraska. 1985 Introduction to the 1985 Edition. In Report on the Mound Explorations of the Bureau of Ethnology, by Cyrus Thomas, Smithsonian Institution Press, Washington DC. 1998 Ancient Monuments of the Mississippi Valley, Smithsonian Classics of Anthropology, Washington DC. (originally published by Bartlett and Welford, New York, 1848). 1931 Report to the Director [Horace M. Albright], National Park Service. Typescript, October 8, 1931.